Synthetic grass dog runs are a clean place for pets to play. Check out the health boosts of turf for furry friends. You’ll find that fake lawn is safer for pups than live grass, thanks to the fact that there are no chemical sprays, less chance of pests and bugs, and lower bacterial risk. A pet run made with faux grass is great for Fido, and is easy for you to care for and to clean. Since faux lawn does not watering or mowing, when you choose turf instead of a live lawn you will save a lot of time. Think of all the ways you can spend those hours. Why not spend them at play with your pet? Synthetic grass dog runs drain more fully and with more speed than real lawn. That fast and full drainage means fake lawn is easy to clean, and odor control is simple since waste and smells don’t stay around. Our top-quality turf has Flo-Rite-Thru technology. Its design helps it drains fast so it can be hosed down with ease, and that is ideal for pet zones. A clean place to play makes your pet happy, and it will make you happy too. Watersavers pet grass is here to help. Top pet facilities like the award-winning Silicon Valley Humane Society choose artificial dog grass. There are very few moments as sweet as seeing a dog at play on a soft green lawn in the sun. Synthetic turf makes it practical to give pets their own grass to play on. Our turf has a real lawn look and feel and makes more sense than real lawn for you and for Rover. 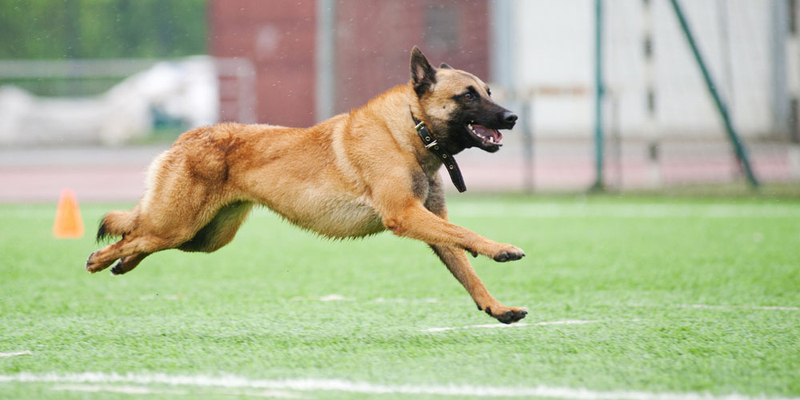 When it comes to wear and tear, few areas see as much use as a dog run. Four legs make for heavy traffic! Under that kind of pressure, live sod wears down to bare dirt, and you will need to reseed it to keep the yard full and lush. Artificial dog grass can stand up to what paws dish out for years. Not only that, you’ll save water and cut maintenance costs. Water costs in CA are on the rise due to the drought, and every gallon counts for the Earth and for your bottom line. If you replace a single square foot of real sod with faux grass, you can save 55 gallons of water per year. With those kinds of stats, what kind of lawn you choose for a whole dog run can have a big impact on your water use. The drought has made live grass a no-go for pet parks, but turf is a smart alternative with the same appeal to the eye. Our free estimates, our full range of tools in stock, and our warranties for home and commercial pet grass help make it easy for you to give turf a try, and offer your pets a health boost along the way. We all know that dogs love to chew on grass, and to rub their faces all over the ground in search of smells. That’s why it matters so much to make sure that what your pet finds there is healthy for them to breathe, sniff, and lick.A real lawn may seem safe, but if you look close, you’ll see that it often wears a coat of chemicals in the form of things like fertilizer, weed killer, and pesticides. Some livesod in commercial landscapes gets a blast of toxic pest control sprays almost once a month. A live lawn may be sprayed ten or more times a year. Dog turf does not need to be treated with those kinds of chemicals to stay pest free, weed free, and green. That means when your pup has a sniff of faux lawn, he or she won’t get a big whiff of toxic pest spray, or of a chemical like glyphosate. That’s found in the popular weed killer Roundup, and the WHOwarns that it may raise the risk of cancer. Pets can be the most vulnerable to harm from these kinds of toxins, due to small lung size. With live lawns, you will often find that dogs dig down past the blades and roots, into the dirt. Dirt can be full of bacteria, which leads to infections and other health issues for pets. Fake lawn stays clean and has no dirt where germs can lie in wait for a pup. When you look at all of those facts, you can see that fake lawn is a smart choice that gives your dog a healthy place to play. From dog turf to infill, all of the turf products at Watersavers are 100% lead-free, and our infills are made without crumb rubber, so they’re safe for pets, kids, and adults. Contact Watersavers for your pet grass and turf accessory needs. We carry a full range of fake lawn products, with odor control infills and all the best items to install and care for pet turf. Get a free estimate, drop by one of our stores, or call us at 844-974-8873.